In the fall of 2009, a group of Suzuki flute teachers and students in Canada, the US, and Taiwan contributed to the purchase of a Di Zhao alto and bass flute for the Orquesta de Flauta Traversas de San Martin de los Andes in Patagonia, Argentina. 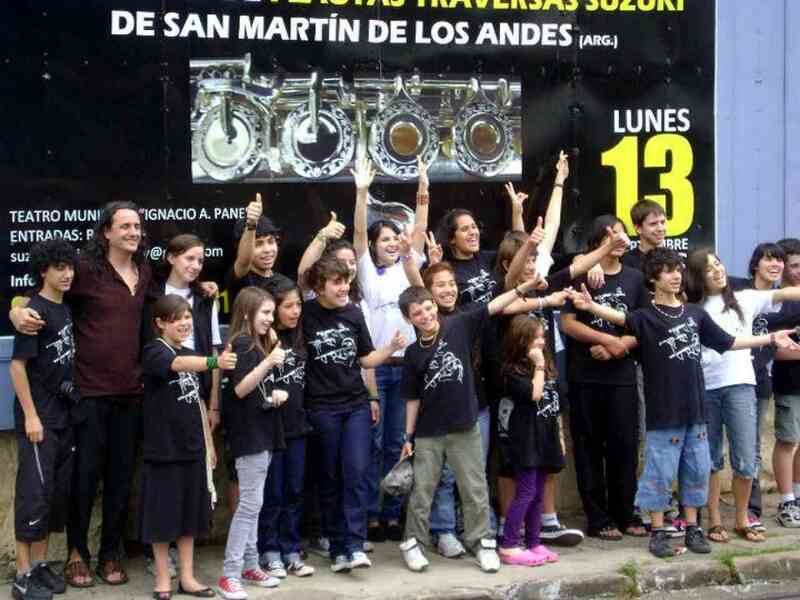 In September 2010, members of the ensemble traveled to Paraguay to give demonstration concerts in local schools, and participate in master classes in Suzuki pedagogy for twelve teacher workshop participants. The twenty-seven-member tour group included flutists from the ages of seven to adult, and they performed Argentinean folk music as well as standards like Eine Kleine Nachtmusik, the concerto for two flutes in C major by Vivaldi, and Passacaglia by Handel. They made big waves: the teachers who heard them play in Asunción immediately set the goal of founding a flute orchestra in Paraguay over the next few years. 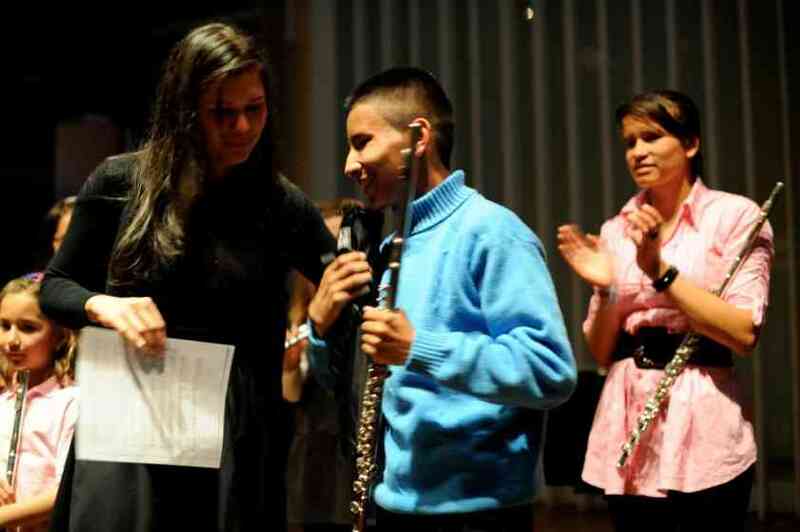 An even greater dream was realized last Saturday, October 9, 2010, when a flute was donated to a blind child in Bogotá, Colombia. 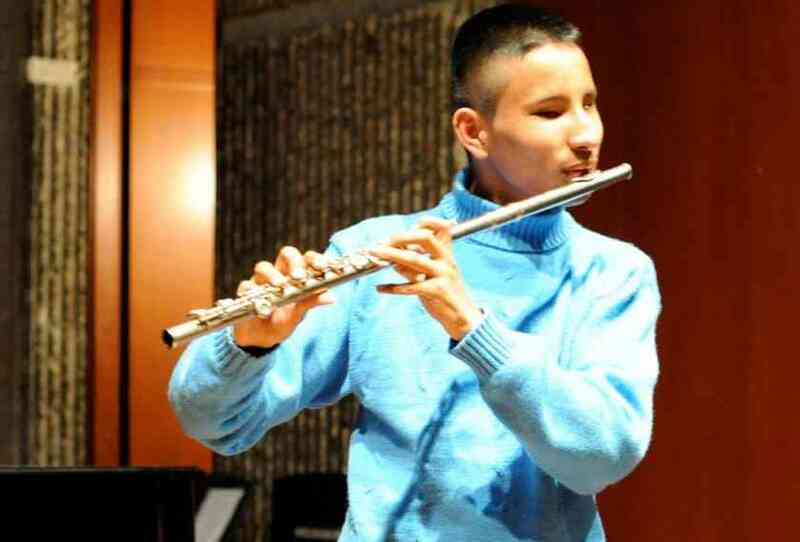 Thanks to the efforts of his teacher, Diana Bettin Mujica, and the generosity of a group of donors, student Nicolas Piracún received the gift of a Di Zhao flute with a solid silver head joint. 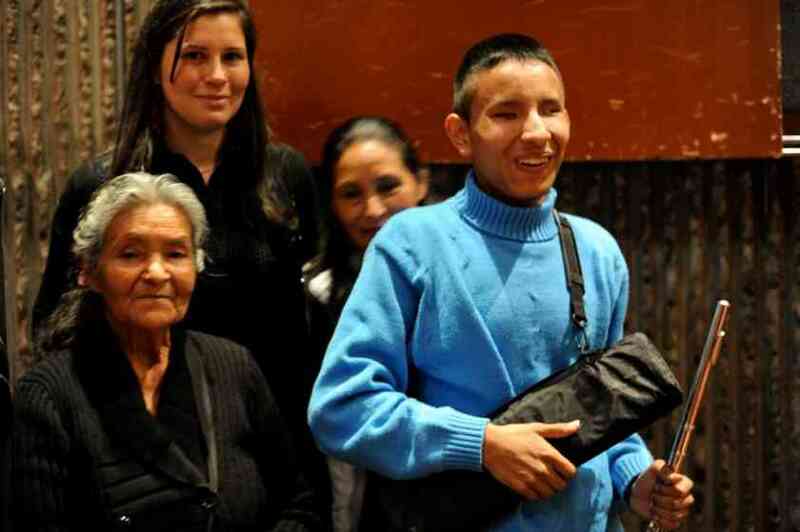 Nicolas lives at the Fundación Juan Antonio Pardes Para Niños Ciegos in Bogotá. The children who live at the institute are all blind from birth or have very limited vision, and they come from poor families. Many are orphans; for these, the other children at the institute are their only family. 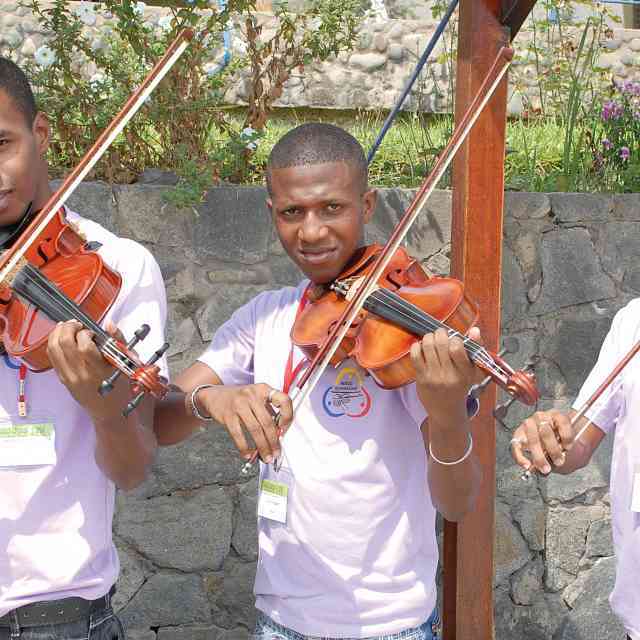 They are taught by three teachers who are also blind: the director of the school, Tarcicio Andrade, plays the flute, and Pablo and Betty play the violin and recorder, and sing. 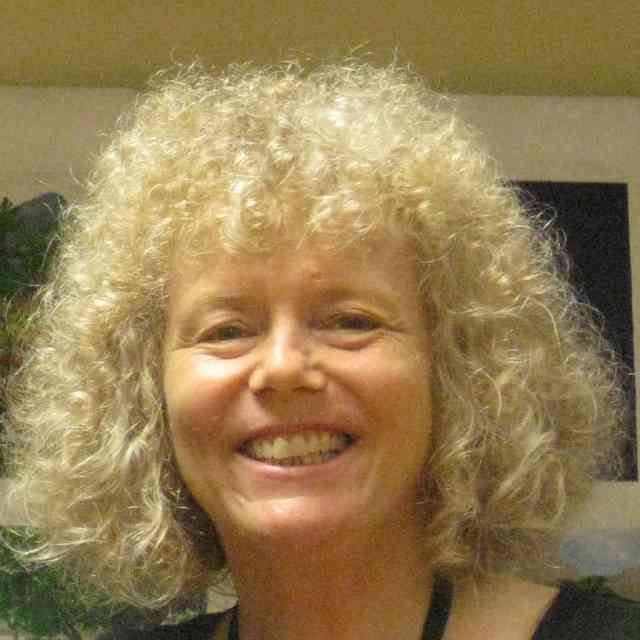 All three teachers have taken Suzuki teacher training to assist them in providing a musical education for the children at the institute, to give them the means to improve their lives in the future, as well as happiness in the present. The teachers are assisted by volunteer teachers such as Diana, from the Universidad Javeriana in Bogotá. The children at the institute have very little besides a roof over their heads and food to eat, the support of their teachers, and each other. 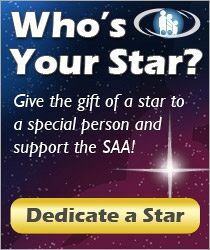 They learn on instruments that have been donated to the foundation—to own an instrument would be unimaginable for most. It was a particular pleasure for me to assist in obtaining the flute for Nicolas. I taught him in master classes in Bogotá in 2007 at the annual Suzuki Festival. 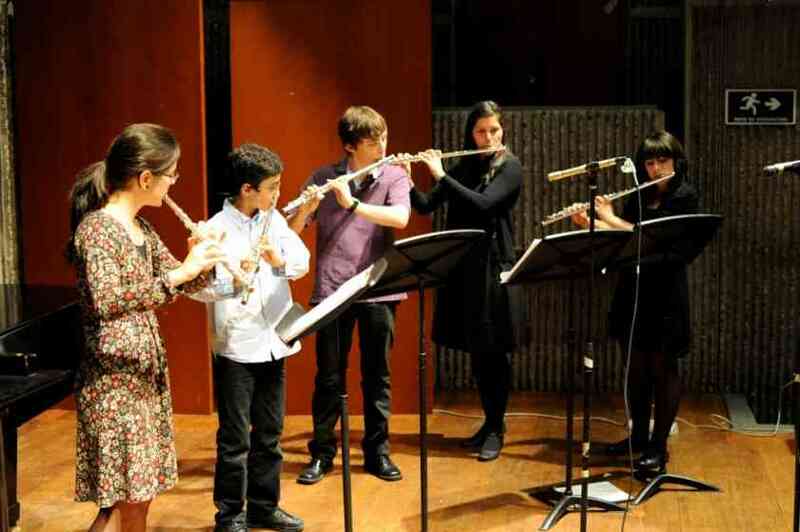 It was the first time that flute classes had been offered at the festival, and fourteen children from the institute were invited to attend free of charge. (Even then, one of the children did not attend class one day because her family could not afford the bus fare…they did not have money to buy food that week, let alone pay the fare.) Nicolas impressed me right away with his courage: none of the children had ever been in such a setting before. They had only been learning the flute for a short while. To travel to the campus and play their flutes for a visiting teacher from Canada, who didn’t speak Spanish, and receive instruction from her via a translator, was all very new and they were very shy. Nicolas was the first to volunteer to play for me. In his master class, he demonstrated poor physical posture and balance of the flute, and during the ten minutes that he played for me, our entire attention was focused on correcting the position of his hands and body. When he stood up to play again the following day, I was astounded to see the change in his posture: he had corrected everything that had been pointed out, as though he had never played any other way. I asked him how hard he had worked to effect such a great change so quickly, and he bashfully admitted that he had practiced for well over two hours the night before—his teachers had finally insisted that he stop at ten thirty so that everyone could go to bed! He was very pleased with my commendation, and also with the admiration of his friends, who all cheered him loudly. At fourteen, he showed himself to be a leader within the group. When a little stuffed pig temporarily disappeared, having been misplaced by a little girl to whom it was lent overnight, Nicolas was one of the teenagers who assured me that it would be recovered—and sure enough, it was presented to me the next day, a little grubby, but otherwise none the worse for wear! I have another memory of Nicolas from that workshop, which is one of the best of my teaching career. Leidy, another student from the institute, had worked so well on the articulations in her assigned piece (The Moon Over the Ruined Castle) that I played a lovely counter-melody along with her as a treat at the end of her master class. Nicolas was sitting quite close to us, with his head leaning on his hand. As we played, he was so moved that he couldn’t help murmuring out loud, “Tan bonita! Tan bonita! (So beautiful! )” I will never forget the expression on his face as he listened, nor the shy surprise of Leidy when the other children all burst into enthusiastic applause at the end. 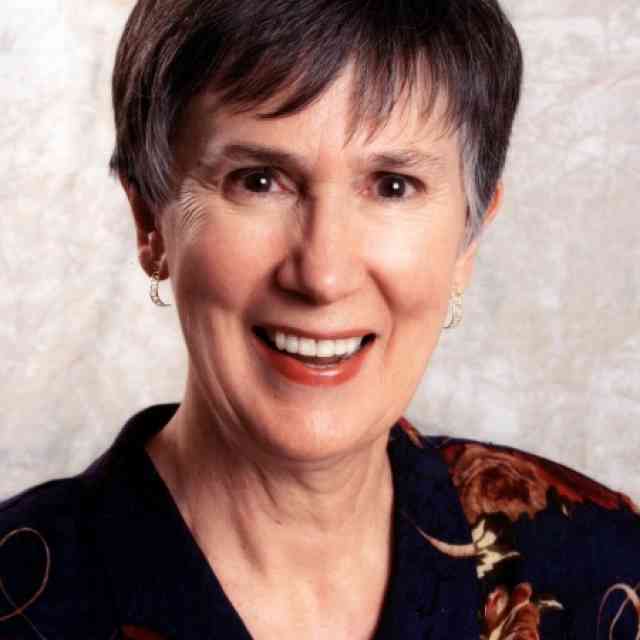 Their sensitivity, and the openness and love between the children, formed an indelible impression on me. We do not have many chances in our lives to make a dream come true for another person. So when I had the opportunity to share from a distance in Nicolas’ joy at receiving a new flute of his own, my heart was very full. It is wonderful to see the inspiration that is spreading outwards to many other people, just from these three instruments. 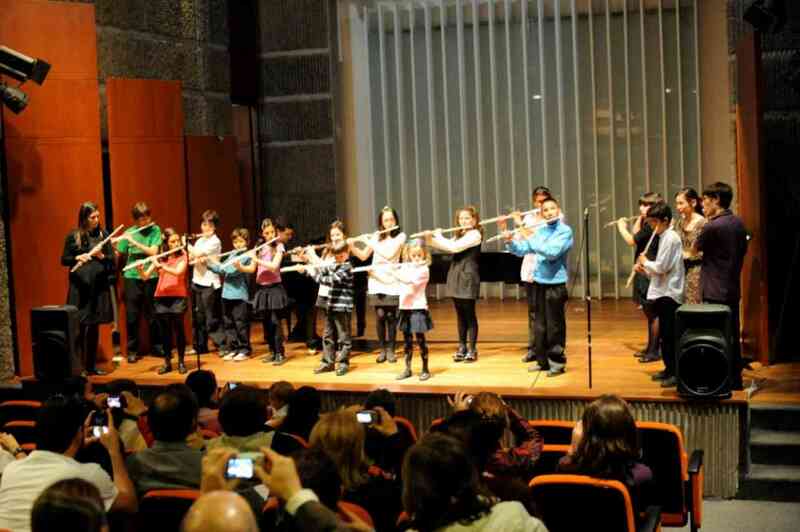 The flute students at the Fundación Juan Antonio Pardes Para Niños Ciegos and the Programa Infantil of the Javeriana University all shared in the satisfaction as Nicolas received his flute in a public concert on Saturday. The audience and donors who were present also shared the joy of that moment. I am very grateful to Mr. Di Zhao for making the alto and bass flutes available at the dealer price for the Orquesta de Flautas de San Martin de los Andes: aside from the forty-five flutists in San Martin, flute attendees at the 2010 Festival Internacional Suzuki in Lima, Perú were also able to try the instruments, and the teachers performed on them in concert. It was the first time that any of them had the opportunity to play on a low flute. Even in the capital city of Lima, these instruments are not available for trial or for rent. Ten-year-old Diego Dalmao from Arequipa, Perú was thrilled to have his picture taken playing the bass flute. Diego is a gifted young musician: as he continues along his musical journey, this will be one of the experiences that he will never forget.